Why Follow Hershey's Lead By Using Non-GMO Cane Sugar? Back in the day, Hershey's Chocolate factory churned out Kisses in California's Central Valley, using locally sourced dairy, almonds, and sugar. Over the years, though, America's beet supply, and thus beet sugar supply, has largely transitioned to genetically modified beets. Big candy companies and other food manufacturers using beet sugar have found themselves a target of anti-GMO ingredients activists. 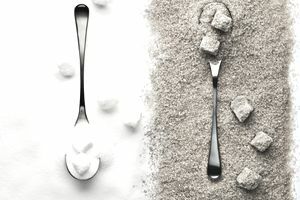 The "simple" solution for entrepreneurs who want to sell their own food products on store shelves or in restaurants should use cane sugar instead of beet sugar. "We are currently leading industry conversations with suppliers and building our manufacturing capabilities to pursue non-genetically modified ingredients. Currently, we offer Scharffen Berger Chocolates, organic Dagoba Chocolates, Hershey’s Cocoa Powder and Hershey’s Unsweetened Baking Chocolate that do not contain genetically modified ingredients. In 2015, you can expect products in our snacking portfolio that include non-genetically modified ingredients. We will be transitioning some of our most popular chocolate brands, including Hershey’s Kisses and Hershey’s Milk Chocolate Bars, by  year end." Cane sugar is one crop that has not been genetically modified. In other words, while you will see some sugar companies choosing to apply for Non-GMO Project Verified seals for their cane sugar, in reality, anyone who works with sugar should know that (as of now anyway) all cane sugar is non-GMO. Additionally, all Certified Organic sugar is non-genetically modified. That is because organic certification guidelines prohibit GMO ingredients. If you see Certified Organic beet sugar or sugar made from other sources, it will not be genetically modified. Only time will tell how the move among Hershey, Mars, and other food manufacturers to using cane sugar will impact prices and whether the beet industry can and will transition to non-GMO beets. When formulating new food products for your business, choosing cane sugar makes sense. Consumers are increasingly choosing to buy non-GMO packaged foods. If you own a small business but want to think globally, choosing cane sugar expands your exporting possibilities. Many countries do not allow foods with genetically modified ingredients. In other words, choosing non-GMO sweeteners for your products is good for business.